Putting the finishing touch to my commentary on the individual Scottish seats poll. 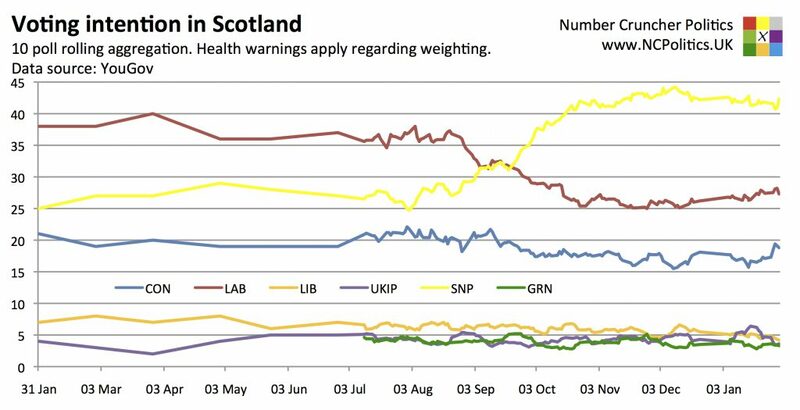 It really is…..
My hope is that the good Lord will supplement his seat polling with a Scotland-wide poll, so that we have a benchmark against which to compare the local swings. This is of particular interest in Scotland vis-a-vis GB polling, because of the large house effects we’ve seen between pollsters. However, comparing the crosstabs of the Ashcroft GB polling since the referendum with my YouGov-derived estimates over the same period, it would appear that his polling produces broadly similar support to YouGov for each party. All the usual caveats about crossbreaks and weighting bias apply, but it’s also worth noting that back in 2010, Populus (who are widely thought to be in charge of Lord Ashcroft’s fieldwork) produced a Scottish phone poll with almost identical figures to a pair of YouGov polls conducted a few days either side. Turning to individual seats, the big takeaway from September was the weak correlation between voting intention (at the time) and referendum vote. Noted SNP heartlands voted solidly “no” while the Labour fortress of Glasgow voted “yes”. While it’s highly likely that the SNP’s gains will be concentrated in Labour-held seats because those, by definition, are where most Labour votes were, the question is how much better will they perform there? Will Labour voters in different types of seat behave differently? Lib Dem seats could be even more interesting, partly because (just like south of the border) the extent of their collapse will make it very uneven. But incumbency effects and personal votes, which could come into play for all parties, are typically much larger for the Lib Dems than for Labour or the Conservatives. Outside of Glasgow, I understand that Lord Ashcroft is also polling Gordon, where Sir Malcolm Bruce is retiring for the Lib Dems and Alex Salmond is standing. Given his recent form when it comes to polling leaders’ seats, I wouldn’t be surprised to see Renfrewshire East on the list too. While Jim Murphy’s incumbency is likely to make the seat unrepresentative, it’s work noting that there were no fewer than eight Scottish seats where the Conservatives polled over 30% in 2010. I wouldn’t rule out the possibility that the votes are so scrambled and split that the Tories are at least in the hunt somewhere besides Dumfriesshire, Clydesdale and Tweeddale, which they will hope to hold onto. UKIP and the Scottish Greens both have single-digit support across Scotland as a whole, but again, those votes are unlikely to be spread evenly. Finally, there is tactical voting, in a variety of potential guises. I’ll be back with analysis once the polling is published.